Finally, beautiful skin for on-fleek makeup and off-shoulder tops! It’s a tale as old as time: your outfit is flawless, but your skin just won’t cooperate. You’ve tried everything, but it seems that you have yet to find the anti-acne product that truly works for you. 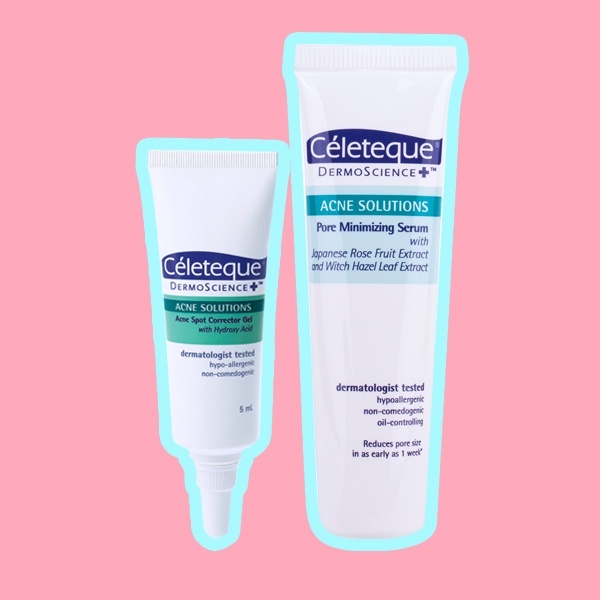 Here, we answer some common skincare troubles with our favorite products from Celeteque, a brand we could vouch is super effective, so you can finally flaunt that perfect look—and perfect skin to match. A: Find a product that not only covers your acne, but also works to fight it. Doll up with the Acne-Clearing Concealer afterwards, which helps you fake perfect skin but also gets rid of acne. Unlike your standard concealer, this one contains salycylic acid and camellia sinensis extract, which contains anti-bacterial, anti-oxidant and anti-inflammatory properties. Best of all, the pen format is perfect for makeup application on the go! 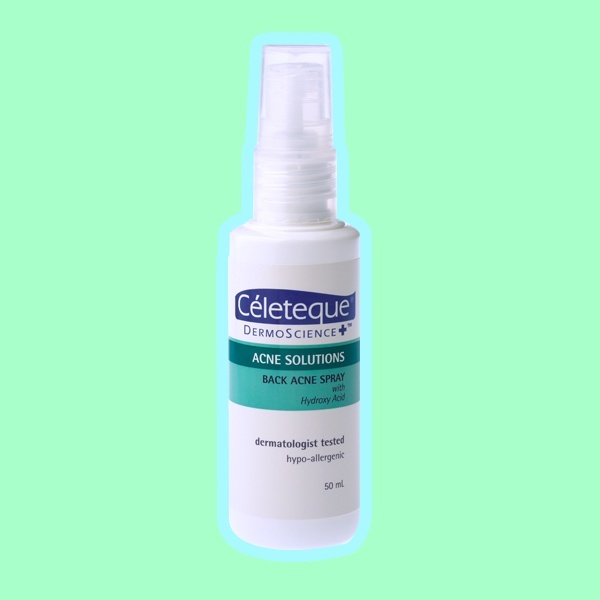 A: Get rid of pesky acne breakouts on your back (hence the term bacne) by using Celeteque’s Back Acne Spray. It has Hydroxy Acids that remove dead skin cells that cause breakouts and prevents future breakouts by reducing pore blockage due to dirt and impurities. Simply spray onto affected areas after bathing (it’s hypo-allergenic and gentle enough to use every day), and you’ll soon be on your way to confidently showing skin. A: For clear skin under strict time constraints, you need a stronger product to tackle your acne spots. 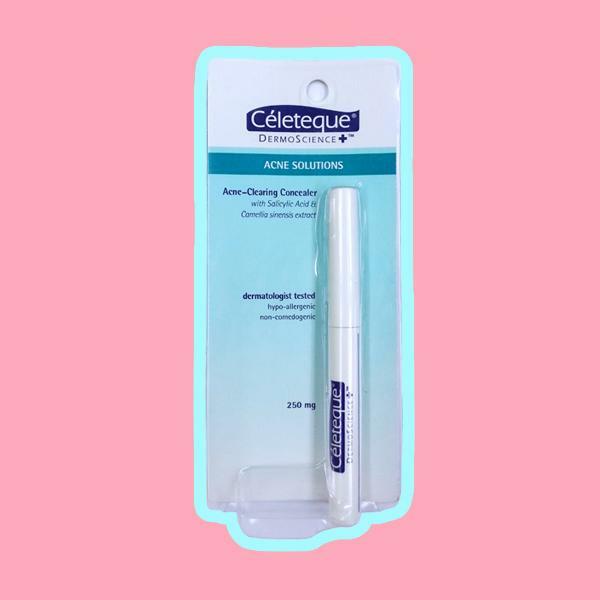 Celeteque’s Acne Spot Corrector is the best solution for this, as you can apply it to targeted areas. The product uses a combination of acids (BHA and PHA) to diminish pimples, while controlling oiliness, so that your spot can be gone in no time. We’d throw in a dab of Celeteque’s Pore Minimizing Serum for picture-perfect skin, too. So now you see that for every acne woe, there is one clear solution. Celeteque’s Dermoscience Acne Solutions range is co-created and tested by dermatologists, so it is sure to deliver results. 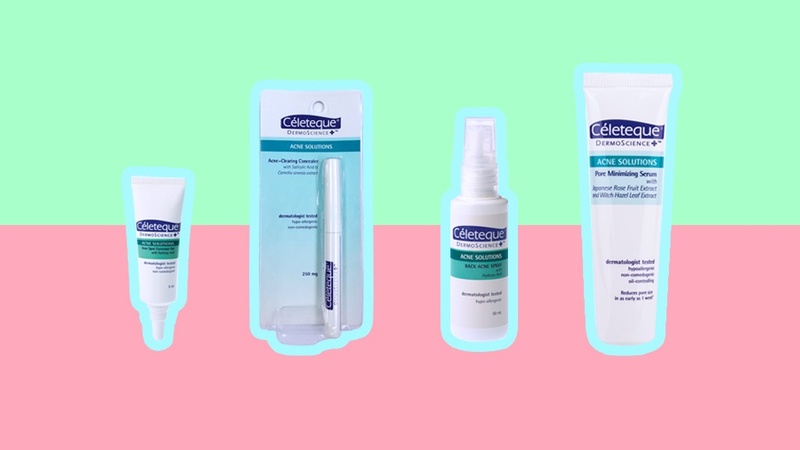 With Celeteque, it’s time to say goodbye to acne for good.